My favorite video game trilogy of all time was the Mass Effect series. I’ve sunk hundreds of hours into different playthroughs, scrolling through the lore, and making decisions that I hadn’t made with older characters just to see what would happen if I did. It was fresh and creative, with just enough throwbacks to its sci-fi predecessors to feel comfortable to long-time nerds, but original enough to stand out from them and carve its own destiny across the stars. Throw in a dash of Lovecraftian-esque horror elements and EA should have had something truly wonderful on their hands. But they messed up, and anyone that followed the release of Mass Effect 3 heard about it. All your thousands of decisions, every good and bad thing you’d ever done, every ally you’d made, every enemy you’d killed, every peace treaty you managed to broker, boiled down to…what color do you want your ending to be? Hours of gameplay stretched across three games boiled down to three choices, and none of them had anything to do with how you’d played the game up to that point. Fans were outraged, the developers had to create an “extended cut” DLC just to placate the angry mobs outside their headquarters, and the series fell to the wayside (before a disappointing fourth game was made and everyone got even angrier). However, I don’t think that Mass Effect 3’s ending was the real problem with the series. I think it goes back even further than that, and has to do with a fundamental misunderstanding of ME’s morality system. If one thing had been tweaked, ME2 would have absolutely blown people’s minds and ME3 could have potentially been one of the most critically acclaimed games ever. First, a quick explanation of the morality system: you don’t have “good” versus “evil”, you instead have “paragon” versus “renegade”. A paragon character is typically kind, forges bonds with his or her crew, promotes galactic peace and cooperation, and the like. A renegade character barrels through the series, getting the job done no matter what the cost, saying that the ends justify the means when the galaxy is fighting for its very survival. A lot of the game’s major decisions that change how the story progresses are paragon v. renegade choices and have rippling effects across all the games. 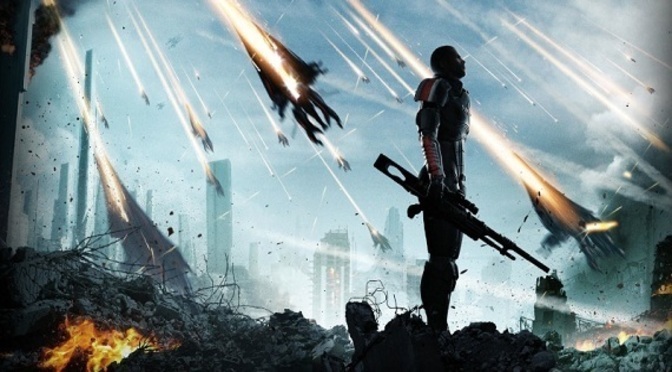 The biggest one, and I think where EA really dropped the ball, was the end of ME2. In the first game, you occasionally cross a pro-human terrorist organization known as Cerberus. They do illegal experiments, build secret tech, design weapons, and put humans ahead of all the other galactic races. All of your interactions with them typically involve bullets to the face. In Mass Effect 2, however, you team up with them out of necessity. None of the “good guys” seem to be wanting to do anything in the face of galactic extinction, and your character partners up with Cerberus’s leader, the Illusive Man (voiced by the always-amazing Martin Sheen). The Illusive Man is the pinnacle of a renegade character: he believes the ends justify the means, human survival is paramount even at the expense of every other race, and someone must make the hard choices that everyone else is afraid to make. The relationship between the IM and you is strained, but the writers did a great job of making this villain…almost sympathetic. At the end of ME2, you have a choice: either destroy the home base of an evil enemy race, or turn it over to the Illusive Man. Here’s the kicker: no matter what you pick, it has zero effect on Mass Effect 3. If you blow up the base, Cerberus and the Illusive Man come gunning for you in ME3. If you turn it over to him, he STILL comes gunning for you in ME3. When I played through the first time, I thought there was literally no reason not to save the base. It housed potential galaxy-saving information ready for datamining, for crying out loud! I turned it over. And as soon as the third game kicked off, the IM is threatening me, telling me to stay out of his way, giving villainous speeches, the works. I was heartbroken that EA had taken such an amazingly written character, stripped him of everything that made him great, and downgraded him to a comic book style villain. But, what if things had been different? What if, at the end of ME2, your decision had been “ally with Cerberus” or “shun Cerberus”? If you had been able to side with the Illusive Man at the end, the third game would have the potential to be wildly different. Now, you’d be playing through ME3 as a true renegade character. The human Alliance declares you a traitor and rogue agent and sends people to hunt you down. Cerberus backs you up, trying to save the galaxy and staying just ahead of the Alliance’s efforts to bring them down. Old allies that you had would now be your enemies, and you could have untold numbers of emotional moments where your friends try and fail to bring you in before you have to put them down. All in the name of the greater good. It wouldn’t even be that wild of a shift in plot that you’d have to create two storylines. ME3 starts off with you grounded and awaiting trial for having worked with Cerberus in the previous game. Then, the bad guys show up, everything starts exploding, and you have to basically steal your ship and become the face of the Alliance. That would have been so easy to change with my proposed ME2 ending! You start off as a prisoner, everything still starts exploding, but then the IM swoops in and breaks you out and makes you the face of a pro-human, Machiavellian military that may be the galaxy’s only hope for survival. You’d spend the entire game as a fugitive, but some people you’d met along the way would still side with you because they believe you can be their savior. I think having that option on the table at the onset of ME3 would have been truly amazing. There would have been so much controversy, obviously, but strictly from a storytelling perspective, the critics would have raved about it instead of writing articles like this. And of course, if you picked the “shun Cerberus” option, the Illusive Man coming for you wanting to rip your head off makes perfect sense. Maybe some of your allies join up with him because they think he’s getting the job done faster and more efficiently. This would still allow for the emotional breaks I talked about in the renegade playthrough, with people you’ve known since the first game asking you to join Cerberus once more, then tearfully turning their weapons on you. One of the things that the third game did incredibly well was tug on your heartstrings; having to fight your former friends just because you’re on different sides of a conflict would have had me in tears for most of the game. So Bioware, if you’re reading, I hope that I gave you a few ideas to take into your next franchise. You’re still wonderful and I play your games all the time; you know where to find me if you need an extra writer! Just wanted to add something not many people are talking about in regards to choice and ME3: There’s some kind of army recruitment going on where you get different factions added to your battle against the Reapers. And while I don’t remember all the details of my play-through (been a while and only played once), I do remember that there was nothing spectacular happening even though I recruited everybody I could. There was a brief mention that the Rachni Queen turned against us but…it just didn’t have any impact on anything at the end.